Packed with FREE golf, the Players Card guarantees the best deals at JC Golf courses and over $2,000 in benefits from Preferred Partners. Share discounts with your friends or keep to yourself – either way, these membership perks are good for one full year from date of purchase! Booking Tee Times Was Never Easier! Download the app of your favorite JC Golf course and save! Lowest rates. No service charge. Real-time availability. Save player type preference. Only 3 clicks to book tee time. JC Golf provides an unmatched selection of golf courses and professional golf services. No matter the event, tournament or outing, our knowledgeable full-service tournament staff will help you plan and execute your next event-ensuring a memorable day on the golf course. Interested in JC Golf course news and information? The ChipShotz news source will help keep you informed of everything going on in the industry, with our courses and our golf team professionals. Stay up to date with ChipShotz! Whether you play golf as a leisurely activity or a competitive sport, JC Golf is right for you. With eleven beautiful public golf courses in San Diego, Riverside and New Mexico, JC Golf is a top competitor for the best public golf courses nationwide. Since 1971, JC Resorts has been a competitive leader for the management and operation of premium golf resorts and properties. Each of our diverse facilities operate under the same vision: impeccable customer service that focuses on attention to detail without stifling formality, and superior golf course experiences in a casual, yet refined setting. From championship to executive golf courses, JC Golf offers phenomenal golf experiences for all skill levels in the San Diego and Riverside Counties. For more information about the game or how to improve your skill and playing level, Golf Lessons and Instruction programs are available at each of our courses including Intro2Golf, JC Golf School and Junior Golf. Looking for the BEST public and San Diego golf course deals? 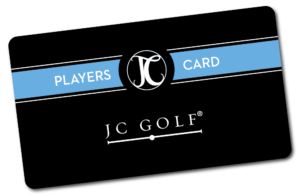 Our JC Players Card provides free rounds of golf with the lowest guaranteed rates, and member privileges at all JC Golf courses throughout the year. *Dates subject to change. JC Golf specials not valid on JC Golf designated holidays.